The Bird is Her ReasonThere are some bodies that emergeinto desire as a godrises from the sea, emotion andmemory hang like dripping clothes - thiswant is likeentering that heated redon the mouth of a Delacroix lion,stalwart, always that redwhich makesmy teeth ache and my skin feela hand that has never touched me,the tree groaning outside becomesa man who knocks on my bedroom window,edge of red on gold fur,the horse, the wildflip of its head, the rake of clawsacross its back, the unfocussed,swallowed eye. 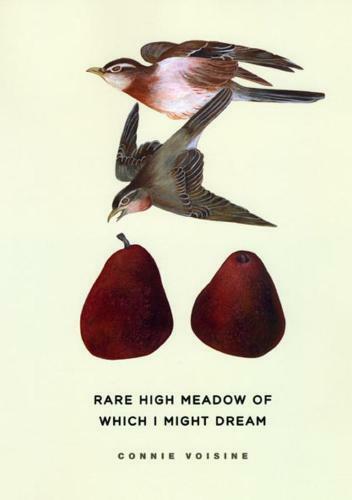 "Rare High Meadow of Which I Might Dream" is a book haunted by the afterlife of medieval theology and literature yet grounded in distinctly modern quandaries of desire. Connie Voisine's female speakers reverberate with notes of Marie de France's tragic heroines, but whereas Marie's poems are places where women's longings quickly bloom and die in captivity - in towers and dungeons - Voisine uses narrative to suspend the movement of storytelling. For Voisine, poems are occasions for philosophical wanderings, extended lyrics that revolve around the binding and unbinding of desire, with lonely speakers struggling with the impetus of wanting as well as the necessity of a love affair's end. With fluency, intelligence, and deeply felt emotional acuity, "Rare High Meadow of Which I Might Dream" navigates the heady intersection of obsessive love and searing loss.